In my previous post, I’d written about one of the GoPro mount getting damaged. One of the 3 hinges that hold the camera broke off, with only 2 more operational. This reduces the strength of the mount and if one more hinge breaks, it will render the mount useless and there’s a risk that I might lose the camera itself, if the brake happens during a shoot (say over water or in air or while driving). While I posted the photo on facebook and in my blog, I also submitted the details on GoPro website help section, seeking replacement. After few days I got a reply, asking me to send a photograph showing the damage. I promptly replied. Option 1: I need to send the whole unit (weighs around 300 gms and consists of about 7 different parts) to GoPro’s Asia regional office in Singapore, with the replacement authorization code given to me. Singapore office will send a replacement unit. The problem here is that I had to bear the shipment cost, which as per DHL and FedEX online quote, is about Rs 2500 one way. This is almost half the price of product itself and any customs/other liabilities extra. Singapore office will have to spend similar amount to send a new unit back to me in India. As a compensation I was offered an option of a spare battery/handlebar mount which is worth USD 20, but this is worth only less than half of my shipment cost. Option 2: Only the end arm (the last part of the mount which got damaged) will be sent to me.I don’t have to mail the faulty unit. I can replace the broken part with this replacement and continue using the mount. But this is a new idea they are working on and timeline for this is not immediately known. I said I prefer option 2, provided it is done within a reasonable timeframe (a month or two). I was promised that it will be faster than that. Main advantage in this option is that I don’t have to ship my faulty unit and I can continue using it for the time being with adhesive. I can save on the cost of shipping it to Singapore and any customs and other taxes, which could add up to 50-60% of the product cost, rendering the whole proposition uneconomic. So I confirmed option 2 of receiving only the end arm without having to send existing unit. One week later, I got a reply that they don’t plan to send end arm alone in near future, hence they will be sending me a new replacement unit and I don’t need to ship the old damaged unit. This is a welcome move and good guesture by GoPro team and I am happy. Now awaiting the replacement unit to arrive. I will update you once it arrives. GoPro support team confirmed that Stereovision is indeed their authorized distributor in India. Note that warranty experience may vary on a case by case basis depending on multiple parameters. This post should give you some ideas, but don't treat it as exact way. 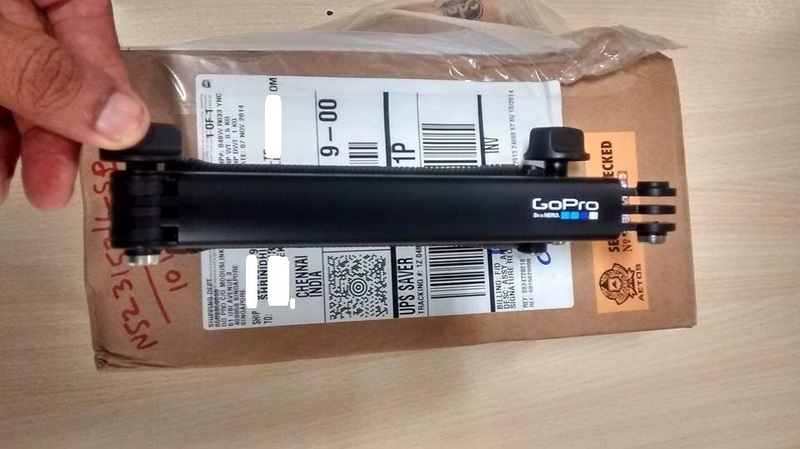 Hi I had a question and not sure if you have the answer if one sends a GoPro camera for replacement from India to Singapore - do we have to pay duty on the replacement? Also I am being asked for a lot of documentation from UPS - is it really needed for a simple replacement? Problem is customs or UPS may not distinguish that a product is being sent for replacement. They treat it as two separate shipments I think. To compensate for this usually GoPro offers some 20-30 dollar item as complementary if you request. Still cost of replacement (shipping, customs etc) at times out weighs the cost of product itself. GoPro should open a support facility in India asap. Might be more practical to send it across with someone going to Singapore.